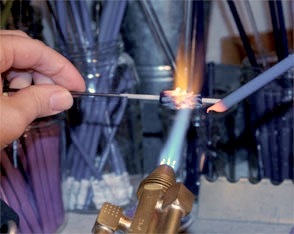 "My name is Andrea Kiernan and I make each and every glass Lavender Bead. The miniature sculpted flowerheads are, for me, a way of preserving the fleeting excitement of the fields in full bloom so that they can be enjoyed as adornments year round. 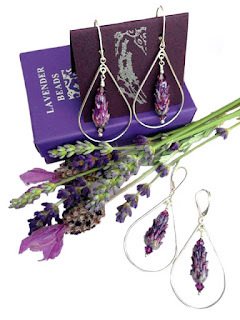 Lavender Beads - What happens when a glass blower obtains job at organic lavender farm. I started making Lavender Beads shortly after the my move from New York to San Juan Island. The island lies off the Northwest Coast of Washington State, part-way between Seattle, WA and Vancouver, BC and is only accessible by ferry or small plane. I relocated here after art school to work in a glass production studio. The glass job didn't last and I ended up finding what I thought would be short term work at the local organic lavender farm (Pelindaba Lavender Farm). 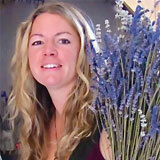 Fast forward 10 years later and I still work at the farm, designing value-added handcrafted lavender products. The 25,000 lavender plants that thrive there are annually blooming inspiration for my original lavender glass bead designs. I create each one-of-a-kind glass lavender bead and assemble jewelry at my home studio (made from clay soil, straw, recycled glass bottles and other salvaged materials) at the end of a long dirt road, in the Pacific Northwest's rainforest-like woods where I live with my husband and our two young daughters. We keep chickens and honeybees and keep a garden with a ridiculous number of unusual lavender species." View Andrea's Lavender Bead line.